Historically, the "X" symbol has been used to mark the end of a search; the location of a treasured item; the final destination at the end of a legendary journey. For the stunning new BMW X model lineup, all of those hold true. BMW's newest line of 2018 Sports Activity Vehicles (SAV)--powerful crossovers engineered specifically to toe the line between rugged capability and opulent luxury--are available now at Hendrick BMW stores in the greater Charlotte area. The 2018 BMW X1 may be the smallest model in the lineup, but it boasts impressive safety ratings, a quick acceleration time by a 228-horsepower 2.0-liter engine, fuel-efficient performance, and up to 58.7 cubic feet of cargo volume. It's the perfect fit for city drivers who require extra capability and optimal fuel economy. Though the new BMW X1 comes standard with rear-wheel drive, BMW's xDrive All-Wheel Drive is an option. The 2018 BMW X2 SAC is the first-ever X2 for the BMW brand, and it represents a pretty shocking--but attractive--change to the classic look of the brand's compact vehicles. The kidney grilles are inverted, the edges are sharpened and well-muscled. The powertrain, though, will feel more familiar: a 228-horsepower turbo four paired to an eight-speed auto transmission, and xDrive all-wheel drive. The already-competitive BMW X3 gets a makeover for 2018, lengthening and broadening the body to provide more head- and leg-room for driver and passenger alike. New tech--including Apple CarPlay/Android Auto--comes standard. But it's not all comforts and quiet: the 2018 BMW X3 gives you TwinPower turbocharged engine performance; 8 inches of ground clearance; 62.7 cubic feet of cargo space; a 29 mpg highway rating; and standard xDrive all-wheel drive. See how the BMW X3 stacks up against the Lexus RX and Mercedes-Benz GLC. 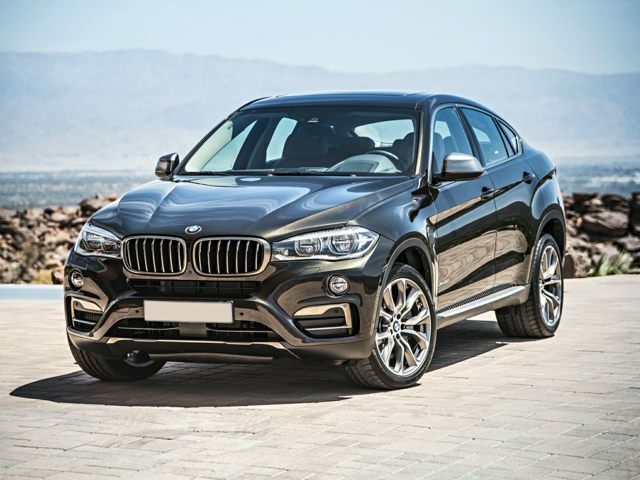 A compact Sports Activity Coupe that sits comfortably right in the middle of the X Series lineup, the 2018 BMW X4 is a tempting, stylish, and fun option no matter where you want to drive it. It offers up 240 horsepower from a standard turbo four-cylinder engine (or 300 horsepower from a turbo six), with nearly 50 cubic feet of cargo space, and standard xDrive capabilities. With 20-way multi-contour seats, a Wi-Fi Hotspot, a Wireless Charging Pocket, and an available third row of seating for additional passenger comfort, the 2018 BMW X5--the first and leading SAV--is a true commander of the road. Add standard xDrive All-Wheel-Drive, 8.2 inches of ground clearance, and optional Dynamic Performance Control, and you have one of the most capable midsize luxury SUV on the market. Don't let the BMW X5 pass you by. Not quite luxury sedan, not quite SUV, the 2018 BMW X6 Sports Activity Coupe is unlike anything else on the roads today. It is joy and exuberance, combined with fearless capability and bold attitude. Inside, this sleek vehicle offers Nappa Leather, pure wood trim, BMW ConnectedDrive with Head-Up Display, 10.2" iDrive touch screen, and an optional Harman Kardon premium surround-sound system. There's even an optional Wi-Fi Hotspot to keep you connected in the city, even when you're way out of town. What separates 2018 BMW X SAVs from other luxury SUVs on the market? Beyond iconic styling like the kidney grille and aerodynamic designs, these models boast the true performance and ingenuity of BMW engineering--the kind that never lets you forget that you're driving a sports car. They also offer excellent capability, spacious passenger and interior cargo room, and the supreme grip of available xDrive all-wheel drive. No adequate substitute is offered in the luxury market--and none would be accepted. It's all of the thrills that you want in a BMW, with the convenience and versatility of an SUV. Explore new 2018 BMW X Series for sale at Hendrick BMW, and learn more about these exceptional new luxury vehicles.